If you want to understand Massive Chalice, you need to understand XCOM. Set in a sci-fi world. It’s a turn-based tactics game with a strategic metagame. You build and research things in real-time, interrupted by enemy attacks which slowly encroach on your world regardless of how well you’re doing. Your soldiers have names, and their stats improve as they survive. If they don’t survive, you need to replace them with fresh, unlevelled meat. Set in a fantasy universe. It’s a turn-based tactics game with a strategic metagame. You build and research things in real-time, interrupted by enemy attacks which slowly encroach on your world regardless of how well you’re doing. Your soldiers have names, and their stats improve as they survive. If they don’t survive, you need to replace them with fresh, unlevelled meat. There are differences, of course, and I’ll get to them later, but Massive Chalice’s adoration for XCOM needs to be kept in the centre of the frame the entire time you’re discussing the newer gamet. 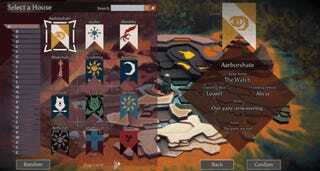 Like XCOM, Massive Chalice focuses on both up-close tactical gameplay and big-picture strategy. It handles the former exceptionally well, far better than it handles latter. 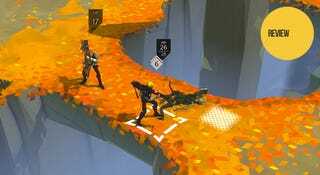 For all the love it has t for XCOM’s tactics design, all the tinkering it does around the edges of XCOM’s formula, Massive Chalice also fails to capture that certain something that made XCOM truly great. You can choose the sigil for each of your five houses. You’ll spend a lot of time here. Massive Chalice is a game of two halves. In one, you’re helping out the Massive Chalice, a huge, talking, immortal cup. This is a strategic game, where through building and planning you try and keep a monster invasion of your kingdom at bay long enough to unleash the Chalice’s power. The other half is tactical, and involves sending warriors into battle against the monsters. The key to XCOM’s success (and its enduring place in the hearts of PC gamers), beyond its smart tactics and successful adoption of table-top wargaming rules, is a sense of attachment. Over the course of a campaign, you will grow to love the troops that you named after athletes and cartoon characters like they were your own children, and keeping those individual warriors safe soon takes on even greater importance than the bigger picture of saving the world. Massive Chalice tries to do this, but in the end your love is ground to dust. Your attachment to XCOM’s soldiers comes not just from the fact they can die, but that they can also survive. You’ll have a handful of badass dudes and ladies who have looked death in the eye dozens of times, badassed themselves to maximum badassery, and lived to enjoy the party that comes after the bad guys are defeated. 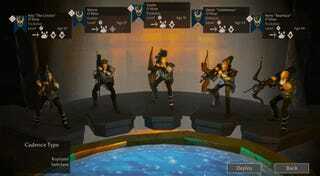 There is no party in Massive Chalice. You’re in charge of a war effort over the span of 300 years, but the men and women fighting for you live normal human lifespans. The heroes you have at the start of the game will fight, marry, have babies, retire to teach and then die. Their babies will grow up to fight, marry, make babies of their own, retire and then die. And that’s provided you keep them alive in battles! If you can’t, then they just die a lot faster. The O’Hine family. Killers, every last one of them. Until they all died. It’s got the right ingredients to get you attached—your heroes have names, and house sigils, and they make cute little babies who lie in cute little warrior cribs—but in the end, despite the game pleading for you to keep them alive through systems like ancestry (where traits are passed down) and item inheritance, I ended up coldly detaching from them. No matter how powerful they are, or how well you’ve looked after them, everyone in Massive Chalice is going to die. Every person is meat for the grinder, I learned, so don’t get attached, don’t try too hard to save them from enemy fire, just keep turning the handle and grinding. And grind you will. Massive Chalice may be set in a fantasy world, but it’s one without gold, or ore, or lumber. The only resources you have at your disposal—time and people—are finite and precious. You expend time researching and building improvements to your realm, which gives you access to more troops and better gear, and you need to “spend” people to get those buildings working, striping you of your ranks of available soldiers. Instead of becoming attached to these individually named and branded and married soldiers, I treated them like coins to be spent. Like coal for a furnace. Functional things, tools for my victory, devoid of any individuality. Furthermore, there isn’t really much to do except watch a clock tick, which makes the big-picture strategic side of the game boring as hell. Luckily, then, that’s only half the game. 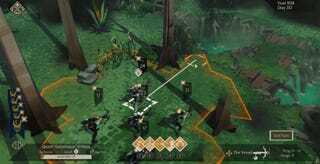 The tactical side of Massive Chalice—the part where you take those soldiers into battle on an isometric turn-based battlefield—is wonderful. It looks great, it plays great, it even feels great, with a sense of weight and purpose behind character movement and animation that I’ve never experienced in a game like this before. At the start of the game, you’re given an army made up of only three classes of soldier. Which seems ridiculously limited, but by cross-breeding these classes together—and I mean literally marrying them off to make babies—you can make hybrid classes, which blend characteristics of the two. If the melee-focused Caberjack has a baby with the grenade-tossing Alchemist, for example, their kids will be melee specialists, only their weapons will have explosive properties. Tactics, too, seem initially limited. There’s no overwatch, for example, so your first few battles involve little more than moving around and hitting things. But as the game progresses, stronger characters unlock a skill tree of special moves, each of which radically alters your approach to the game. 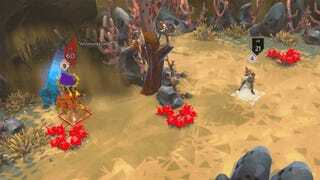 Hunters (the game’s snipers) can cloak themselves to scout out enemy locations, while Alchemists soon earn the ability to throw grenades without using up any action points. Combine these abilities with the fact the cross-bred classes have their own skill trees to unlock and you’ll find that by the middle of a game you’ll have a ton of varied and entertaining tactical options at your disposal. Enemy variety is also fantastic. Instead of just introducing varying types of enemies that exist only to harm you on the battlefield—though to be sure there are plenty of those—Massive Chalice has bad guys that can hurt you strategically. One ranged enemy can sap characters of XP, knocking out earned abilities, while another—the terrifying Wrinkler—will age a character by five years every time they’re touched (and you see it happen in real-time on the tactical map). Watching my best soldier go from strapping young man to grey-haired pensioner in just two turns is one of the cruellest, saddest things I’ve ever had to sit through in a strategy game. All those years they could have bred or instructed future generations of troops, lost in a heartbeat. I really like Massive Chalice. Yes, it has a fundamental problem in how it presents your relationship with its soldiers. And yes, it has other problems too; the big-picture strategic side of the game is dry and dull It will often run games down dead ends through a lack of feedback and cruel random events, wasting hours and hours of playtime as you’re forced to restart (something it actually seems quite proud of). But for all the ways it doesn’t manage to channel the magic of XCOM, it gets a lot of things right. The art, the weight of the characters, the novelty of cross-breeding classes. The fact the game auto-generated me a Hero called “Panye West”. Even the voice acting is great, which is saying a lot since the only voice actors in the game are playing the role of a giant cup. As a love letter to XCOM, Massive Chalice may miss some of what made its progenitor great; it’s all tributes to hair and eyes with nothing spoken of the heart. But it’s hard to get too down on Double Fine’s game for that. What’s there is still a good time.